Despite the enormous popularity of video games, young learners still love to play board games with family and friends. Designing a game for others to play can double the fun. And it can add engaging learning opportunities to a course on any subject, including English as a Second language. Why are games so engaging? Most people would explain the appeal of games by saying that games are simply fun–and they are fun–but why are they fun? What makes a game enjoyable to play? I have a few ideas on the subject. Games are a lot like stories. You have probably noticed that there are elements that both games and stories share–common elements that help to explain their common appeal. Like fiction, what happens in a game feels like it matters but doesn’t really. When the tears begin to flow, we console each other saying, “It’s just a game,” or “It’s just a story.” Both games and stories engage the imagination and are non-literal. Like the protagonist in a story, we start off with a goal, hoping for success. Depending on our luck or skill, we experience sudden reversals of fortune. Like a well-told story, the outcome of the game remains uncertain. Our fortunes change for better or worse when we draw a card or roll the dice. There has to be enough excitement in both stories and games to keep us engaged. However, when we encounter long chapters of exposition or periods of grind during a game, we remain patient and wait for the excitement to start again. There is mystery and adventure. Like any protagonist, we take risks in games with bold moves, hoping that our fortunes will improve by tempting fate. The bigger the risk, the bigger the emotional highs and lows. Games and stories provide a kind of emotional exercise. Whether they end on a happy or sad note, the emotions we experience as we travel through a game or a story leave us emotionally refreshed. As with stories, we feel real emotions when our luck changes. We feel elated when our luck suddenly improves. We feel frustration and disappointment when we fall behind. When our opponents draw a lucky card or roll sixes, we feel envy, and our desire to win heightens. In our imaginations, the other players can transform into threatening antagonists that draw out dark competitive instincts. We imagine that we must defeat them. When we lose, it feels tragic. When we win, we feel relief and satisfaction. Until that point, we feel uncertainty because we can never be sure what will happen next. The emotions are real. In this way, games and stories are cathartic, clearing away fear, pity, envy, and aggression to re-balance our emotions. Like a house cat stalking a leaf in the backyard before reclining and preening itself in the sunshine, we summon the wildness inside us momentarily in games and stories before reattaching the collar and leash of civility. In other words, games and stories help to tame the the wild animal within us by giving it a safe form of expression. In short, games and stories domesticate us. Games produce cooperation. Players must establish the rules at the beginning of the game, taking turns and agreeing to pay attention to the game until the end. Players who withdraw from the game before the end have broken an important rule. You must stick it out until the end. Games involving cards or dice require players to accept the consequences of drawing a card or the roll of the dice and act accordingly. If designed well, the game will provide multiple opportunities to reverse your fortunes before the game comes to an end. In this way, the game rewards continued cooperation with chances to advance. 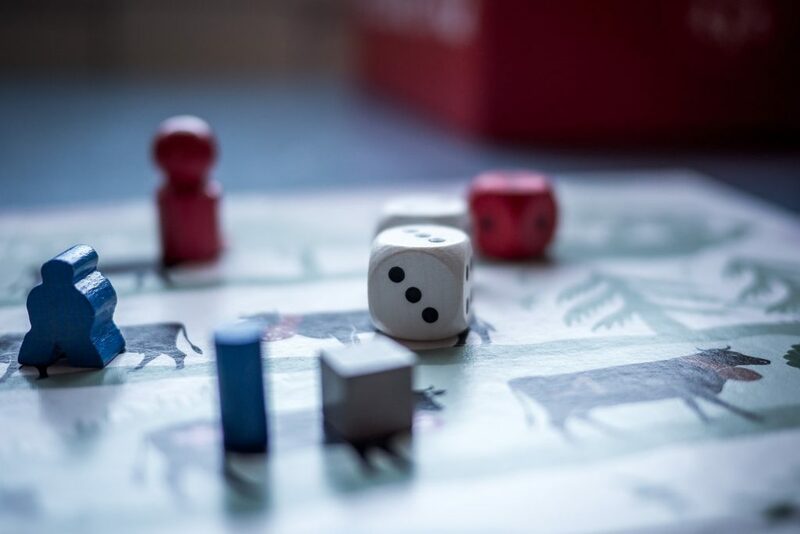 While many games involve elements of luck using cards and dice, we tire quickly of games that depend entirely on luck, especially if there is no prize at the end. When no skill is involved, there can be no significant ego boost for the winner. Then, the reward has to be extrinsic. Door prizes and lotteries are examples of games entirely of chance. The less likely you are to win, the the bigger the prize has to be at the end for anyone to want to play. Games of skill are different. Players need to be pretty evenly matched for the game to seem fun. If one player is much better than the other, the novice will soon lose interest in playing when every game predictably ends in a humiliating defeat. Nevertheless, if the novice gains skill quickly while playing the game, a loss is not really a loss. Skill is the reward. Ideally, games should have a combination of skill and luck for players of different levels to play together. Weaker players feel hopeful that this time they will win. Stronger players feel the uncertainty that comes while drawing a card from a shuffled deck, blindly selecting tiles from a bag, or rolling unpredictable dice. In games involving skill, players can observe their opponents’ strategies and tactics, and then emulate or prepare for them. Players can increase their chances of winning trivia games by studying. Scrabble players study the dictionary. Chess players read books on strategy and study the games of the grand masters. Winning a game of skill that you usually lost in the past can be immensely satisfying. Because games require goals, investments of time, rules, and reversals of fortune, designing a game can be a learning opportunity for students. Not only will students gain a deeper understanding of what makes a successful game fun, they can review grammar, vocabulary, and facts related to their lessons while designing a game for others to play. Creating card game and game board templates, however, can take time away from the content of a course. Adjusting borders, cell padding, and tables can take hours away from the language you are trying to teach and or the concepts you are trying to review. It would be a whole lot easier if someone would just make a bunch of templates and share them with everyone else, right? Well, that’s exactly what I have done. 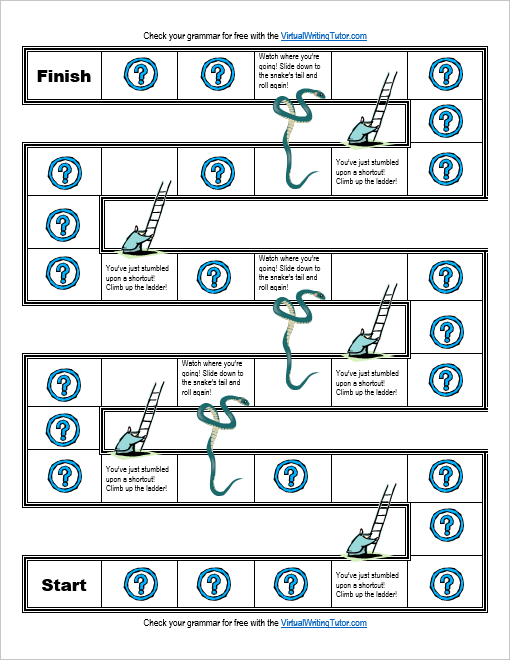 On this page, you will find a variety of board game templates that you can download and adapt to your learners. All the templates are in MS Word DOCX format for letter-size printers. My goal is simply to share. Sharing gives me a reason to tidy up unfinished ideas that I have had knocking about my hard drive for years. These templates are something I started working on in 2002 while working at Chonnam University in Kwangju, South Korea. Sharing might also bring in new visitors to my website and could introduce them to my free grammar checker, a project I have been working on since 2012. 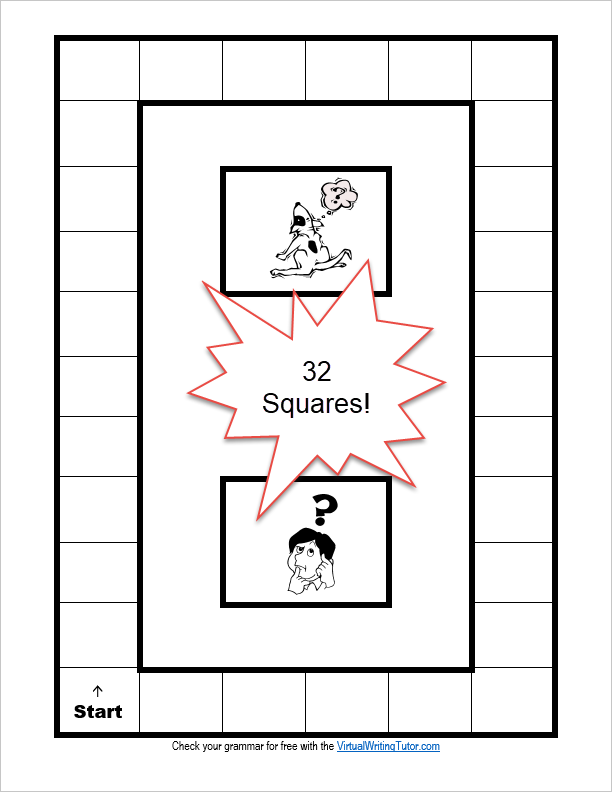 If you would like to share these templates with your students or colleagues, please share this link to my free board games and card games page. (Right-click and copy address.) Please feel free to send the link by email or on social media so that all of this work doesn’t disappear into internet obscurity. For more free games, have a look at my free downloads page. For example, there is a card game for learning sports-games-and-exercise, a free Go Fish card game, and a game for learning advanced vocabulary and tricky translations from French. If you are looking to order a textbook that uses vocabulary card games in a college-level English class, see my products page. 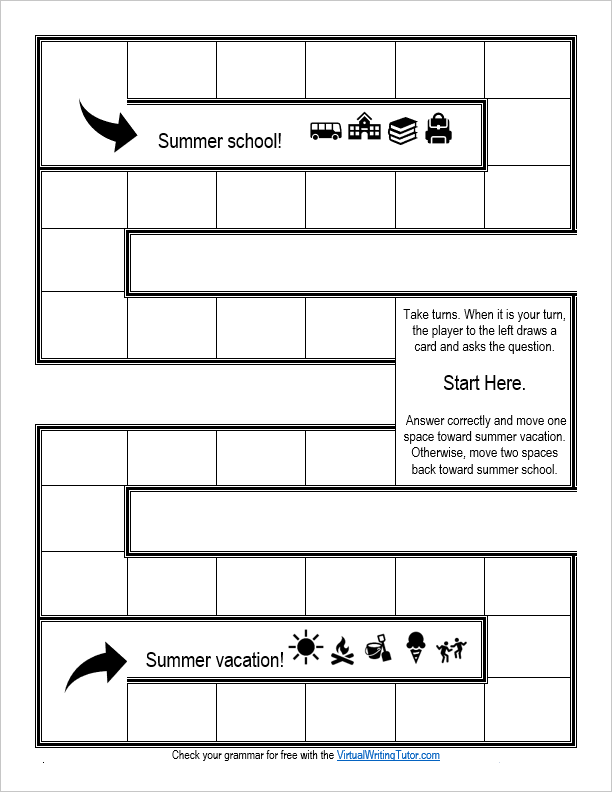 This board game template helps to drive home the importance of reviewing concepts from the course if you don’t want to have to repeat the course during summer vacation. The idea is that you should start in the middle of the game board. To earn points and move toward summer vacation, players draw cards from the card deck and answer questions. A correct answer moves you closer to summer vacation by one square. An incorrect answer moves you two squares closer to summer school. Teachers can create their own cards with review questions that will be on the final exam, or even better would be to get students to create review questions from the chapters in their textbook. Blank cards are below. Alternatively, use the Virtual Writing Tutor’s Error Correction Card Game by clicking on the link. Everyone has probably heard of Snakes and Ladders or by its other name Chutes and Ladders. The concept is simple. Players try to race to the end by rolling a die. If a player lands on a square with the head of a snake, he or she slides down to the snake’s tail. Conversely, if a player lands on a square with the foot of a ladder, he or she climbs up the ladder to the space at the top. 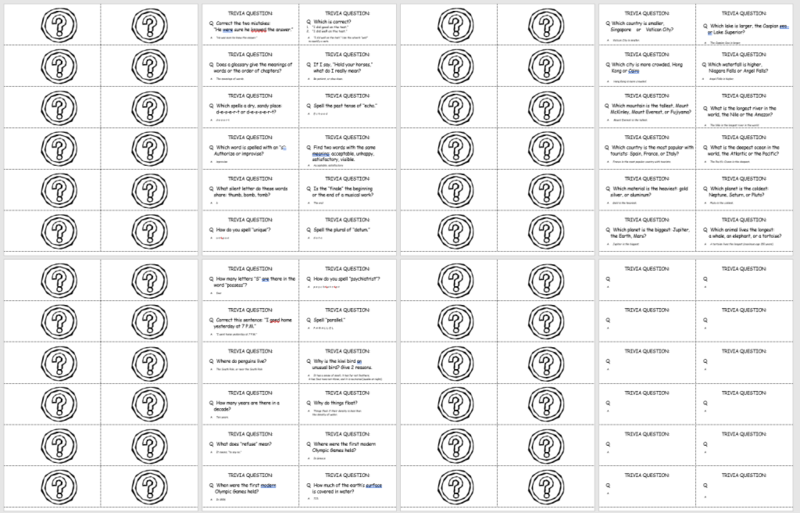 In my version of the game, I have included spaces that require student to select a card and answer a trivia question. 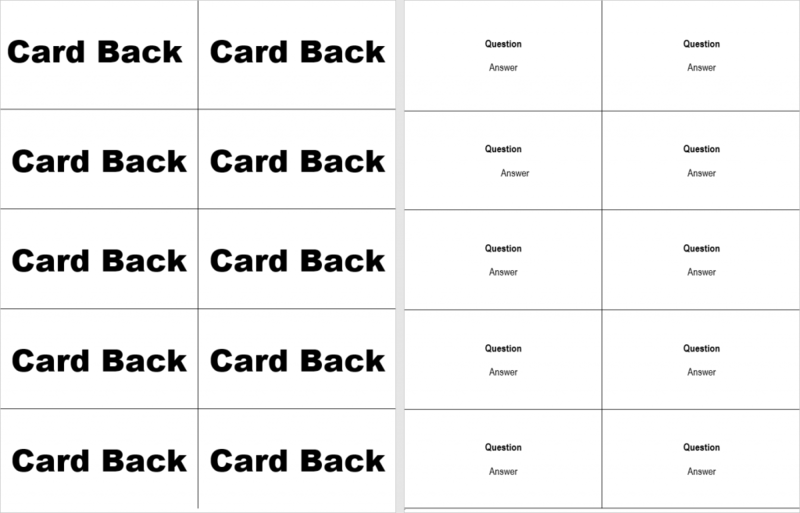 You can use the blank card game template to make your own questions or you can use the questions I have made, adding and changing them as you like. 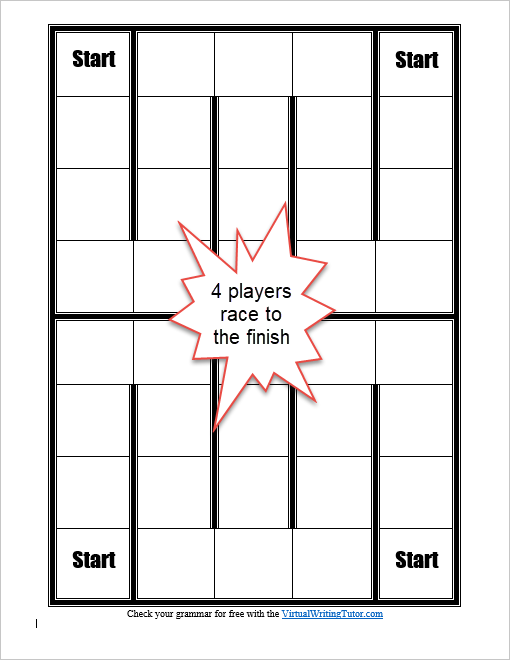 Here is a game board template designed specifically for 4 players. The spaces are large enough that you can write instructions in each square. When players land on a square, you can have them select a card or instruct younger players to do silly things like sing a song or count by fives. 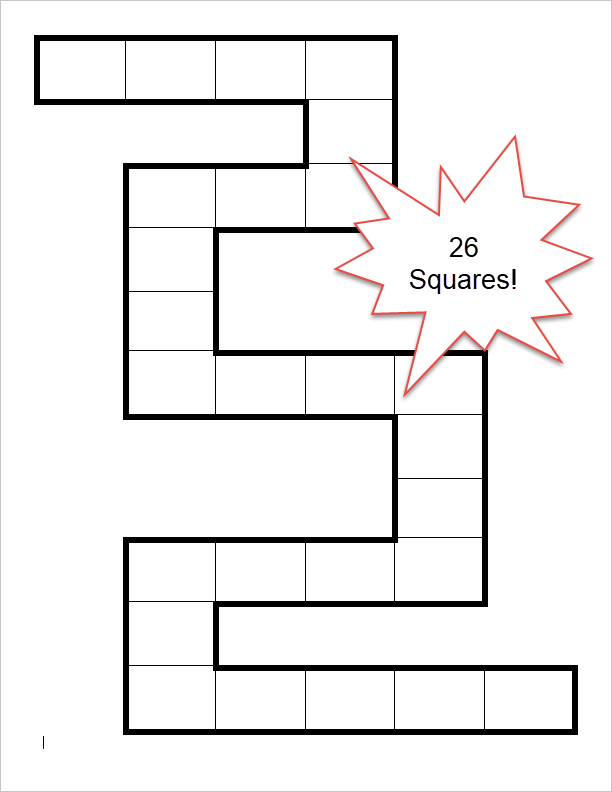 The game board contains 32 squares. You can write instructions in each one or instruct players to select a card. You can get students to colour squares different colours that match the colours of cards. Possibilities abound. This template has a nice shape with a double headed cross in the center. 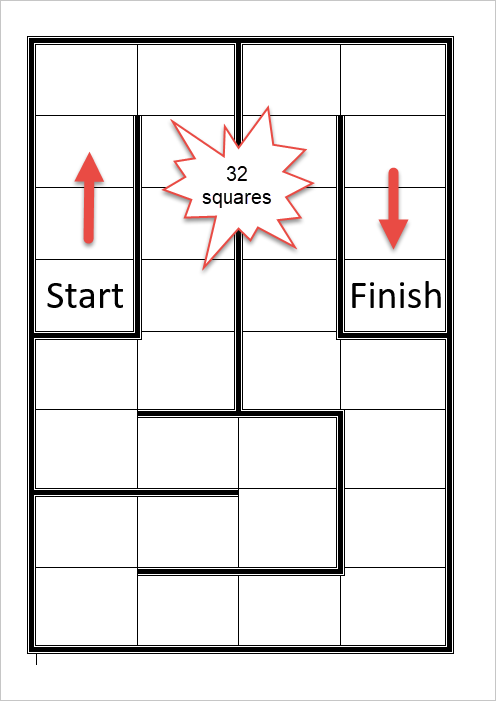 You sacrifice spaces and room to write in the boxes when you experiment with the shape of the game board. Therefore, experimenting with colours and cards, money, or another kind of point system could work. 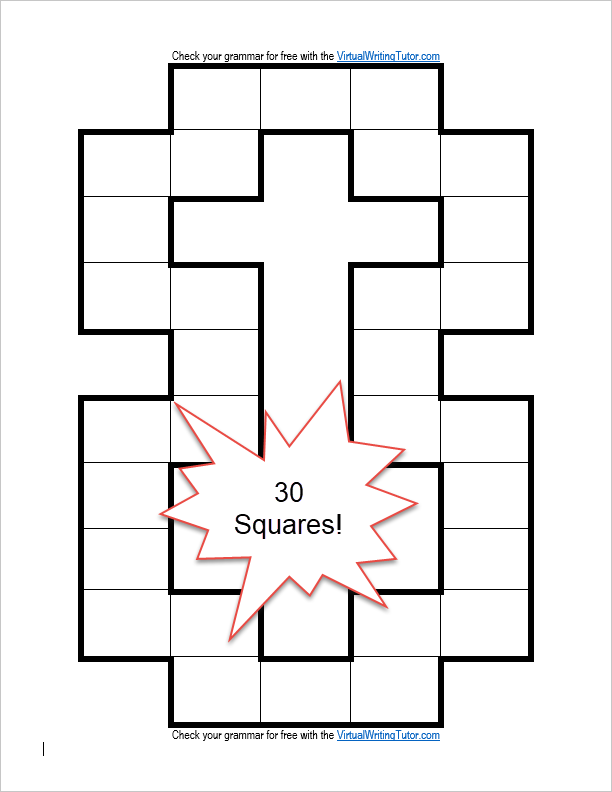 This board game template will remind you of a famous real-estate game. I never enjoyed the original it that much, but my kids like it–at least for the first 20 minutes. Essentially, you go around and around buying the spaces you land on or paying rent to visit. There are chance cards to complicate things. The person who buys everything and impoverishes everyone else wins. It is more of a lesson on the immorality of Capitalism than a game for kids. Nevertheless, it is a well-known board game to model a new game on. This funny worm-shaped game board has 26 spaces. It might appeal to someone and spark an idea for a fun game. You never know. The Candy Land Board Game has a snaking path like this. Perhaps you dream of knights and dragons or soldiers and tanks. 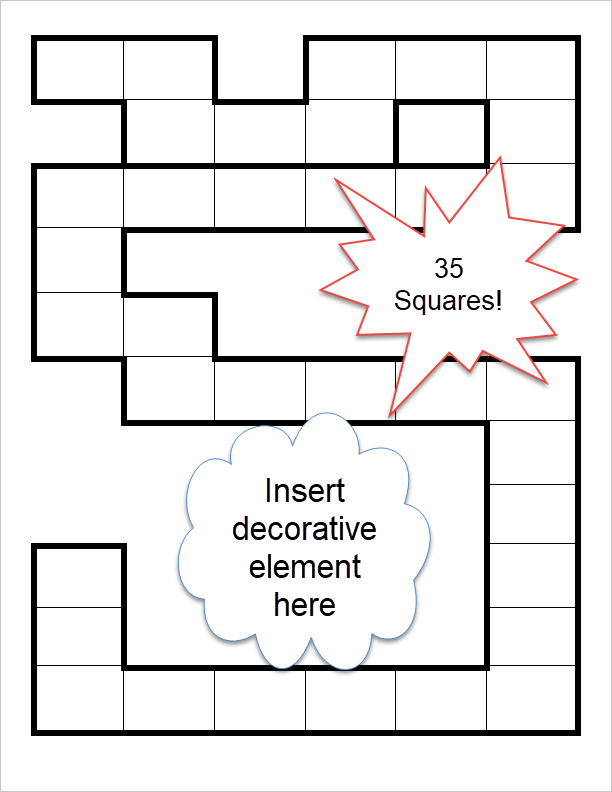 This 35-space game board template has a big empty space in it to allow the game designer to add a decorative or thematic element in it. Why not? When the goal is to get to the end and you don’t want the game to end too quickly, you will need more squares to slow the players down. 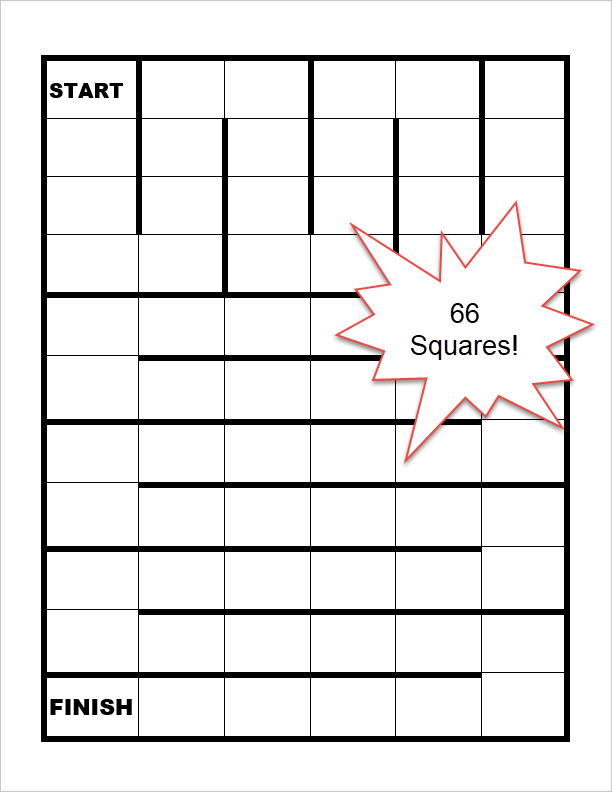 This game board template has 66 squares. The fastest you can get to the end is to roll eleven sixes. With two players, that 22 turns. With three, that’s 33 turns. You get the idea. Many squares means more game play. This game board template reminds me of a library with many bookcases to navigate. So there you have it. A bunch of templates that you and your kids or students can use to build your own board games with chance or trivia cards. I hope you like them and share them with your colleagues. Please be sure to check out my other blog posts and try the grammar checker with students. I keep adding new features to this website, hoping to provide teachers and students everywhere with something non-trivial that could help. Contact me if there is a feature or resource you would like me to develop.